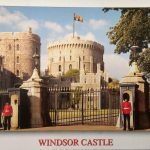 Many thanks to Angela for sending this postcard of Windsor Castle. It is the oldest and largest occupied castle in the world, and the venue for the recent wedding of HRH Prince Harry and Miss Meghan Markle. You can read more about the castle here.